Shapleigh School sixth graders explored the Gulf of Maine Research Institute in Portland on April 11 and 12. GMRI pioneers collaborative solutions to global ocean challenges, and is dedicated to the resilience of the Gulf of Maine ecosystem and the communities that depend on it. Click here to view photos from the field trip (taken by sixth grade teachers Miranda Casey and Lauren Roy). Kittery's Got Talent Now Online! Kittery's Got Talent 2019 is now online! 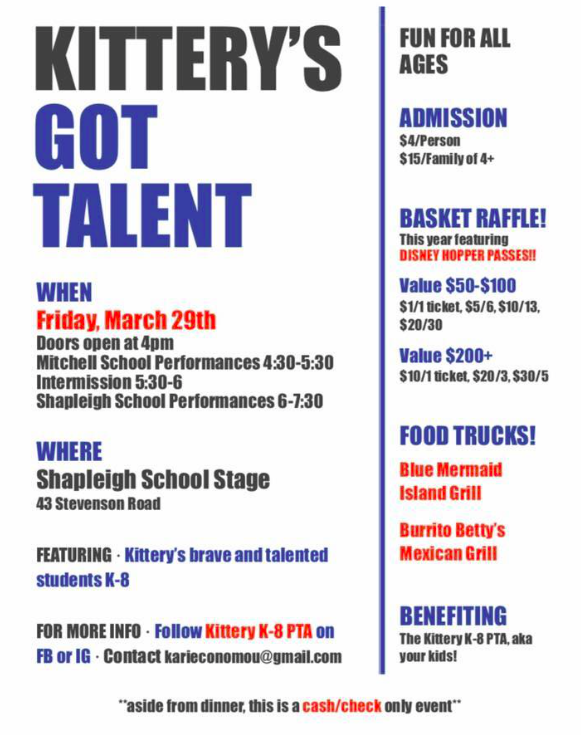 Watch all of the great Shapleigh School performances from last Friday's show that benefitted the Kittery K-8 PTA. Thank you to Charles Denault and Camden Wiles for filming and editing. Shapleigh School eighth grader Emerson Hale was named the Rotary Club of Kittery's Student of the Month for March, it was recently announced. Emme was honored at the rotary's monthly breakfast held at Kittery Estates on Tuesday, March 26, 2019. Pictured: Emme with her parents, and eighth grade mathematics teacher Tracie Ankermann (picture taken by Superintendent Eric Waddell). "I'm so happy to hear that Emme Hale is selected for Student of the Month. It's hard to believe it was 5 years ago that she was in my third grade class over at Mitchell. The 8-year old Emme was a hard worker who set high expectations for herself. She was always a positive role model for her peers and treated everyone with kindness and respect. From what I hear, all these positive qualities haven't changed a bit. I do have to put in a plug that I love watching her play basketball too. A leader on and off the court!" "As a coach of Emme's in soccer for years I can tell you that she gives all of herself and does a great job at showing proper sportswomanship during athletics. As a community member with a daughter who is very friendly with Emme, she is always a welcomed guest in our home as she is polite and exhibits refreshing manners." "Emme is a wonderful writer, a conscientious student, an engaged learner in the classroom, and a role model for her peers. I enjoyed teaching her and I am proud of her continued success in school." "Emme has always been a driven, hard working student. But she also maintains a great attitude and is willing to help teachers and kids. She takes her work and athletics seriously, but she also has a kind heart for helping others. It has been a pleasure to watch her grow and mature into such a wonderful student over the years. She is well deserving of this award." 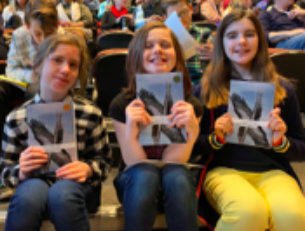 Forty Shapleigh School students celebrated their book release on Tuesday, March 19, 2019 at the Star Theatre in the Kittery Community Center. This celebration was the culmination of a 12-week writing residency with Teaching Artist Elisabeth Aroneau from the Telling Room. Students were elated to see the finished product after months of work. They shared selections from their work to a packed audience of friends, family and community members. At left: seventh grader Samantha Bailey (with her parents). Bailey's work was selected to be published in the Telling Room's anthology, Sparks, this spring. 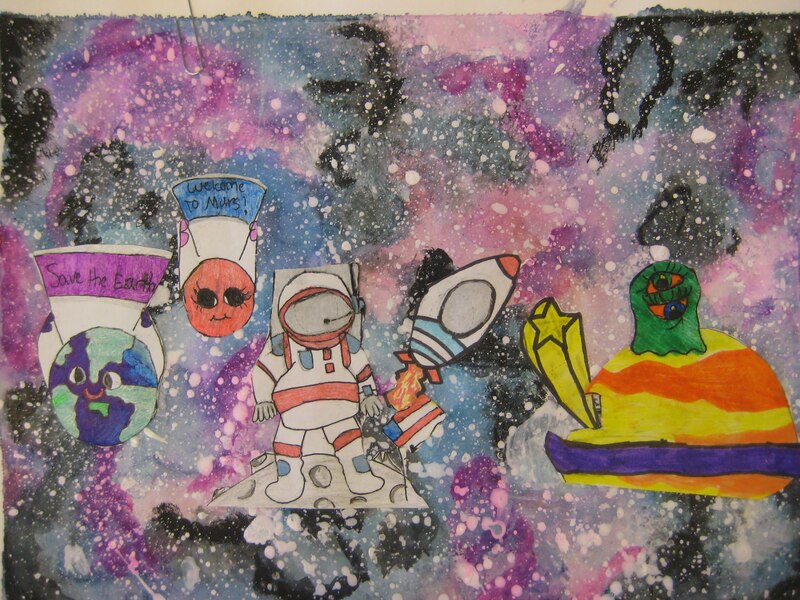 4th grade: Remick M., Elyse D.
5th grade: Luna V., Abby P., Mackenzie M.
6th Grade: Ollie M., Elivia M., Ian S., Sienna G., Meredith M., Franny B., Nahlah R., Myles S.
Click here to view the doodles of the 13 finalists. Dozens of Shapleigh School and Traip Academy singers took the stage at the National Music in our Schools Month Choral Concert in the Shapleigh gymnasium on Wednesday, March 13, 2019. Led by Shapleigh choral director Jayne Segedy, Traip choral director Lawrence Wescott, and pianist Rebecca Austin-Bolster, 10 songs were performed. Click here for the combined choruses singing I Am But a Small Voice (featuring solos by fourth grader Annabella Cenkner, sixth grader Jonas Byrne and 12th grader Leneah Herrin). Also, Families First has announced a series of upcoming Family Programs and Parenting Classes in Portsmouth, Seabrook and Somersworth, NH. For more information, visit https://www.familiesfirstseacoast.org/wp-content/uploads/2019/02/March-April-2019.pdf.